McGill alumnus John O'Keefe was named co-winner of the 2014 Nobel Prize in medicine, for his contribution to the discovery of cells that constitute the brain’s ‘inner GPS,’ which makes it possible to orient ourselves in space. O’Keefe, who received his doctorate in physiological psychology from McGill in 1967, is director of the Sainsbury Wellcome Centre in Neural Circuits and Behaviour at University College London. 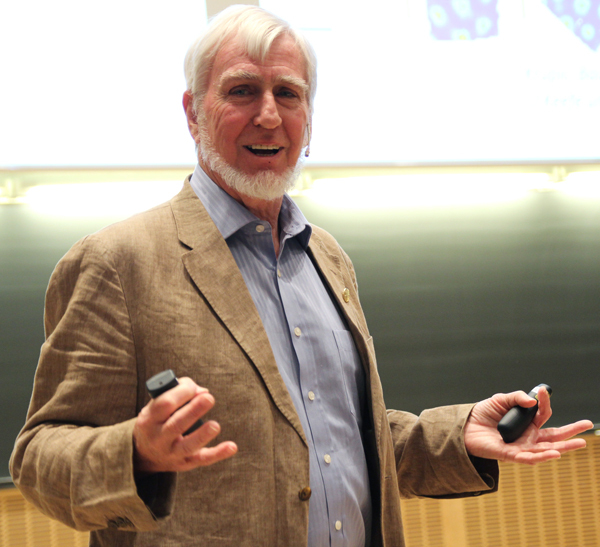 McGill alumnus John O’Keefe was named co-winner of the 2014 Nobel Prize in medicine, for his contribution to the discovery of cells that constitute the brain’s ‘inner GPS,’ which makes it possible to orient ourselves in space. O’Keefe, who received his doctorate in physiological psychology from McGill in 1967, and an MA in 1964, is director of the Sainsbury Wellcome Centre in Neural Circuits and Behaviour at University College London. His co-winners of the Nobel Prize in Physiology or Medicine are May-Britt Moser and Edvard I. Moser, both based in scientific institutes in the Norwegian town of Trondheim. “The discovery of the brain’s positioning system represents a paradigm shift in our understanding of how ensembles of specialized cells work together to execute higher cognitive functions. It has opened new avenues for understanding other cognitive processes, such as memory, thinking and planning,” the Nobel Prize organization said. The discoveries of O’Keefe and the Mosers “have solved a problem that has occupied philosophers and scientists for centuries – how does the brain create a map of the space surrounding us and how can we navigate our way through a complex environment?,” the Nobel organization said in a press release. “In 1971, John O’Keefe discovered the first component of this positioning system. He found that a type of nerve cell in an area of the brain called the hippocampus that was always activated when a rat was at a certain place in a room. Other nerve cells were activated when the rat was at other places. O´Keefe concluded that these ‘place cells’ formed a map of the room. O’Keefe, born in 1939 in New York City, earned his PhD degree in McGill’s Department of Psychology. He holds both American and British citizenships. O’Keefe was fascinated by the problem of how the brain controls behaviour and decided, in the late 1960s, to attack this question with neurophysiological methods. When recording signals from individual nerve cells in a part of the brain called the hippocampus, in rats moving freely in a room, O’Keefe discovered that certain nerve cells were activated when the animal assumed a particular place in the environment. He could demonstrate that these “place cells” were not merely registering visual input, but were building up an inner map of the environment. O’Keefe concluded that the hippocampus generates numerous maps, represented by the collective activity of place cells that are activated in different environments. Therefore, the memory of an environment can be stored as a specific combination of place cell activities in the hippocampus. May-Britt and Edvard Moser were mapping the connections to the hippocampus in rats moving in a room when they discovered an astonishing pattern of activity in a nearby part of the brain called the entorhinal cortex. Here, certain cells were activated when the rat passed multiple locations arranged in a hexagonal grid. Each of these cells was activated in a unique spatial pattern and collectively these “grid cells” constitute a coordinate system that allows for spatial navigation. Together with other cells of the entorhinal cortex that recognize the direction of the head and the border of the room, they form circuits with the place cells in the hippocampus. This circuitry constitutes a comprehensive positioning system, an inner GPS, in the brain. Last month, O’Keefe and Brenda Milner, professor in McGIll’s Department of Neurology and Neurosurgery, were named co-winners of the the biennial Kavli prize in neuroscience, along with Marcus Raichle, Professor of Radiology, Neurology, Anatomy and Neurobiology at the Washington University School of Medicine in St. Louis. The laureates were recognized for the “discovery of specialized brain networks for memory and cognition”. In an interview with Nature Reviews Neuroscience about the Kavli prize, O’Keefe said that he was “very fortunate to get a graduate place in (Donald) Hebb’s Psychology Department at McGill University, one of the most important centres for what was then called ‘physiological psychology’. The term ‘neuroscience’ had not yet been invented. To read the Reporter’s exclusive interview with O’Keefe just days after he won the Nobel Prize, go here.